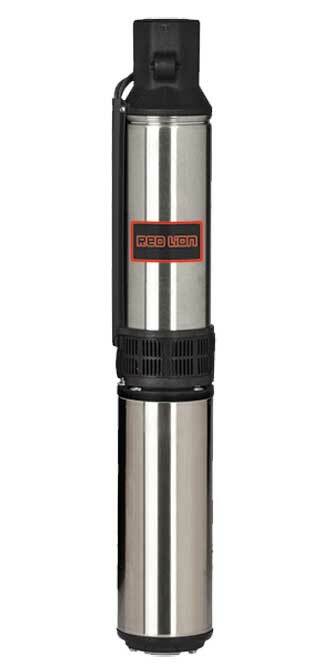 Move water from your well to your storage tank easily using this Red Lion Submersible Well Pump. This sturdy unit is specifically designed for use with wells up to 200' deep, and will certainly provide a reliable draw of water for many seasons. Its classic, stainless steel chassis creates a durable frame, and the 3.75" diameter is perfect for use in 4" diameter or larger wells. A band of suction screening above the single phase motor prevents debris from entering the unit and clogging its impellers, for full water flow and a reduced risk of corrosion. The 1 1/4", thermoplastic discharge head allows plenty of water to reach your holding tank, and its built-in check valve keeps pressure in the system while preventing backflow. Using 230 volts for power, the 3 wire, 1 horsepower motor ensures reliable operation, and the included control box provides the right power to the unit. Transfer water from your well to your holding tank using this Submersible Well Pump. Three year limited warranty.